The impeachment talk reflects the conclusion of Democrats and Republicans close to the Senate Judiciary Committee that Kavanaugh's confirmation is more likely than not — and certainly more likely than it was 24 hours ago. A well-known Democratic strategist says the "only question is who calls for it first." And top Republicans expect President Trump to begin making an even bigger issue of his own possible impeachment as a way of whipping up supporters in the final month of this fall's midterm campaigns. A veteran Republican close to Senate leaders and the White House: "Impeachment of Trump and Kav will be an animating issue on both sides." 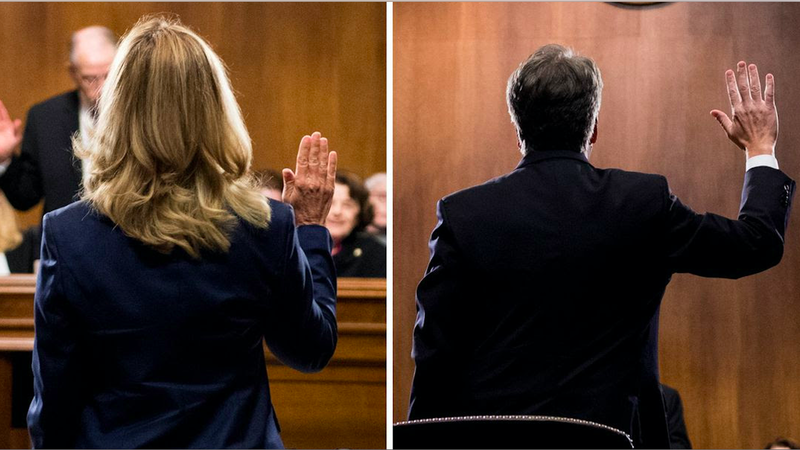 Why it matters: Yesterday's epic hearing — a tearful, outraged Kavanaugh following a tearful, credible Christine Blasey Ford — will likely stand as a nine-hour distillation of our toxic era. What to watch: "Democrats tonight are depleted, raw, furious, and churning," emails an adviser to Ford's camp. A Republican insider texted his belief that Kavanaugh will make it (something the insider had doubted earlier in the day) and added: "What ugly times. We may be doomed." The war was embodied by Sen. Lindsey Graham (R-S.C.) who rallied the GOP by caustically accusing Democrats: "What you want to do is destroy this guy’s life, hold this seat open and hope you win in 2020." The N.Y. Times' Jeremy Peters tweeted: "[W]hat I saw today was a fury between members of opposite parties that is as profound and unnerving as I've ever seen. They're not faking it." Be smart: If Kavanaugh is confirmed, Democrats could be expected to question the legitimacy of his swing Supreme Court vote. Congress degraded itself yesterday. And the Trump White House of course has serious credibility issues.